Fairly easy to design install and build, Garden ponds add a little extra interest to any garden. If it be for fish, water lilies or just for the aesthetics a well designed pond in any landscaping project adds value as well as being a calming addition to the garden. You can build you own pond either using using pond liners, or preformed garden ponds. Some local council regulations may need to be met before building a garden pond. A successful pond will be deep enough to allow plants and fish to have cool water, water flow is also essential to maintain a healthy garden pond. Ponds need to be located on a flat area. They are best not beneath large deciduous trees or other trees that drop a lot of leaves. Ponds should be located in a safe area according to local laws and regulations. Consider if you are including a garden waterfall or stream. Work out the size of the pond and mark it on the ground. Use a level to ensure that the area is flat, now is the time to make adjustments. Ponds can be any depth however .5 metre at the deepest is a recommended minimum. For fish ponds a greater depth will be required. Decide if you are going to have a ‘plant shelf’ around the edge. Recommended for many water plants. 25cm suits many plants. Dig the pond and allow for the plant shelf. Remove any sharp sticks rocks or other objects that could puncture the pond liner. You may choose to pre line the pond with old under-felt or carpet to help prevent punctures. Line the pond with a proper pond liner. Ensuring adequate overlap around the edges. Place your edging material on top of the pond liner with the liner coming up behind the edging material. Use a bucket as a sump for the pump. This makes it easier to remove and clean. You may wish to line the pond, especially any shallow parts with rocks or gravel to improve the look. Fill the pond with water and test the pump. Place water plants on the pond shelves. Correct design is the secret of how to build a pond. A well designed water garden or pond adds a tranquil feature to your home and can add value to your property. From a simple stand alone unit, a pre cast pond or a waterfall, stream and pond combined a few factors need to be considered. Garden pond construction profile, showing plant shelve design and rock edge placement. Usually a fall of about 30cm in 3m is enough for a stream to run. Water loss can be minimized by using a good quality pond liner to line both the pond and stream. Streamside planting to provide shade can also help minimize water loss through evaporation. Rocks and stones lining the stream help give a natural look. Rocks around a pond also look great. Water flow is important, so a quality pump and filtration set up is essential. Pump suppliers can recommend an appropriate pump for the required water flow. No water garden is complete without plants. Astilbe, Dicentra, Lobelia, Aquilegia, Ferns, Hostas, Rhododendrons, Rodgersia, Water lilies all do well in damp conditions. Plants provide a more natural look as well as protection from sun. Keeping fish in ponds is a popular hobby in many parts of the world, Koi, which are sometimes referred to as the ‘Swimming jewels of the Orient’ are the most popular of all pond fish. Koi are a small Japanese fish used in ponds for the color and movement that they bring. Garden ponds are a great feature in any garden, and when you use specialist garden pond liners and provide shade for you pond by using appropriate garden plants water loss from garden ponds and other water features through seepage can be minimized. Ponds kits are readily available, these include preformed garden ponds made from UV stabilised PVC or similar products. A waterfall flowing into a garden pond is another element to consider adding to your garden pond design. Fountains can be another very worthwhile feature in any garden pond. All you need to create a stream is a gentle slope and access to electricity for a pump to circulate the water, storm water can be captured from your roof and stored in a tank to feed or top up the stream. Garden Pond design can be simple, a pond liner with rocks for an edge and a solar powered pump will do the job. 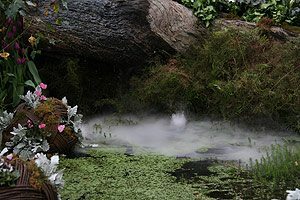 Or you could install a more fanciful design, perhaps a natural woodland setting, with a trickling waterfall, logs and plants to the edge and a misting fountain to create a magical effect. The trick with pond design is to work on your idea until you have a firm understanding of how it will fit into your overall garden design, and to use quality materials, especially pond liner.